Bramblewood Fashion | Modest Fashion & Beauty Blog: Spring Scarves Collaboration with Southern Belle in Training! 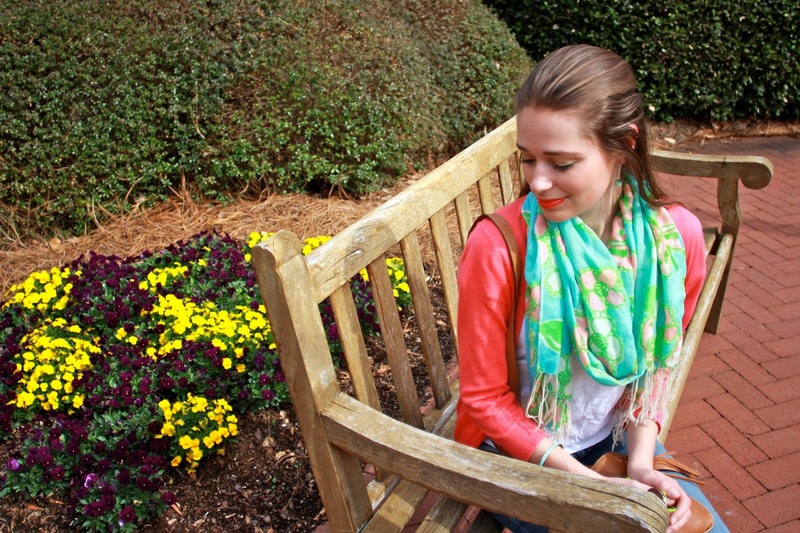 Spring Scarves Collaboration with Southern Belle in Training! Hello everyone! How are y'all doing? I've been keeping busy with work, Bible Study, Seniors Luncheon, hanging out with friends, etc..., that I've haven't put too much time into blogging lately. 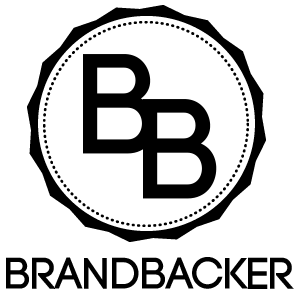 Though of course, it really hasn't been that long since I've done a bunch of posts, but to me personally it feels likes years. I guess that is what happens when you blog weekly for almost six years [I think] come August. Anyhow....onto today's post, which is going to be a fun one. I'm do a fun collaboration post with Annaliese over at Southern Belle in Training today, where we each share how we style scarves with our outfits, so be sure to check out her blog to see her post too. You can see a little sample of her outfit in the picture below. :) Anyhow, Annaliese is a young Christian lady who is attending college in the south [hello sunshine! 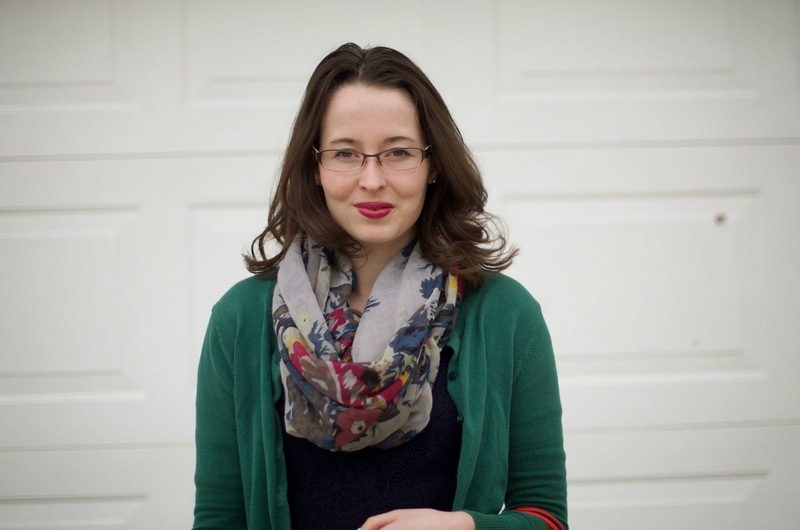 ], loves fashion and makeup [like me], and is from Maine originally. 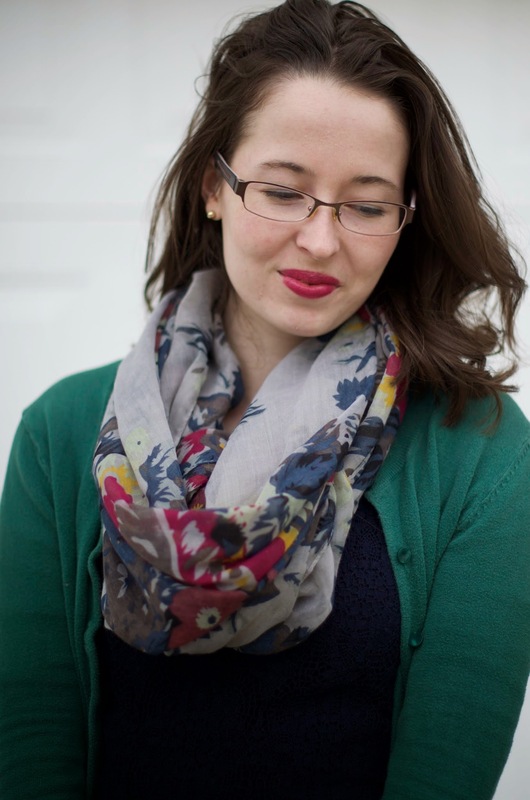 When ever I'm wearing a scarf there are usually two ways I go about styling it. 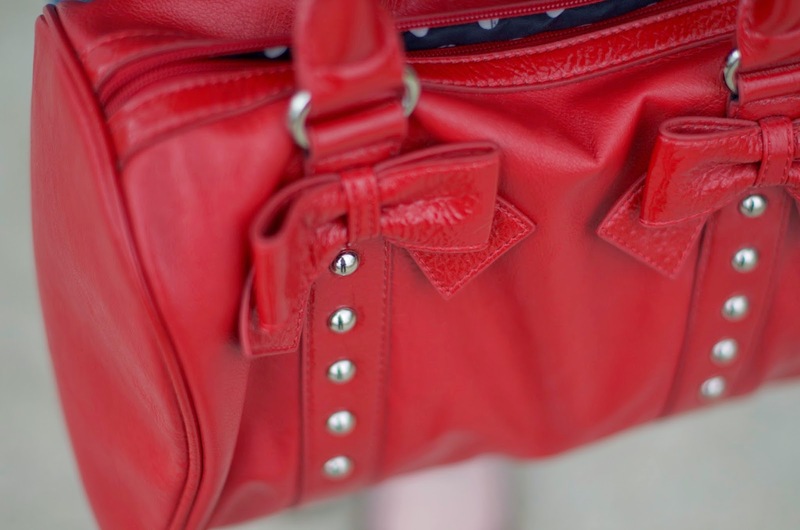 Today, I'm sharing how I use one to help pull an outfit together. Another way I would wear a scarf is just to add some interest to a rather boring outfit, or just keep me warm from either some chilly winds or weather. 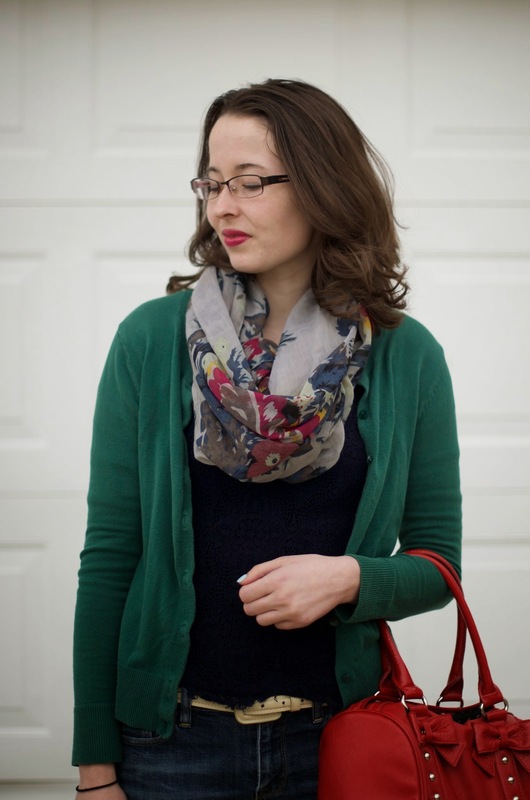 How do you use a scarf to pull an outfit together? First you build your entire look around the scarf you want to wear and decide a couple of things when looking at your scarf. First, is this outfit going to be casual or dressy? What colors can be found within the scarf? What style vibe does the scarf give you when you are looking at it? These are all questions that you need to ask yourself when creating your outfit. 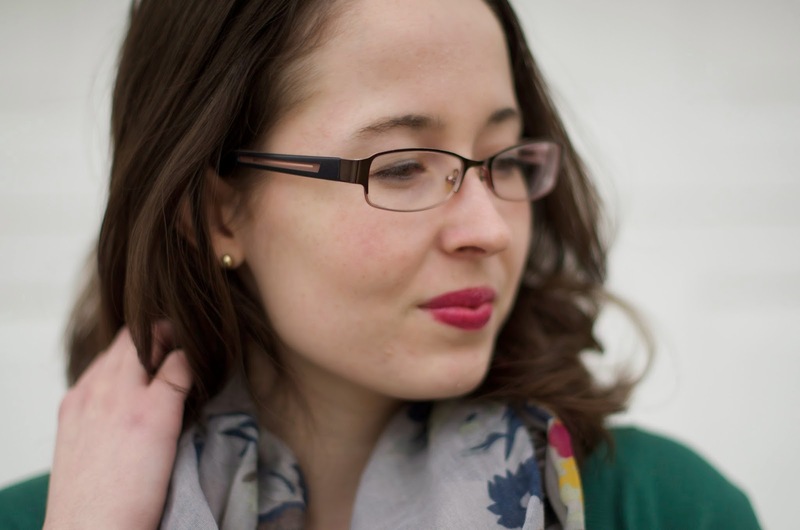 When I was looking at my selected scarf, which I had picked up at Forever 21 several years ago, I knew I wanted to do a semi-dressy outfit that was preppy, with pops of color brought out by the scarf. I create my outfit base with the lighter washed jeans and navy lace top [the added texture of the top, adds interest]. Next came the layers or the frosting on the cake, but not the decoration persay, which for my outfit was the cardigan and shoes -- these help add personality to the outfit and pull more colors out from the scarf. The final step is the decoration, which was my lipstick color choice and my choice of purse. 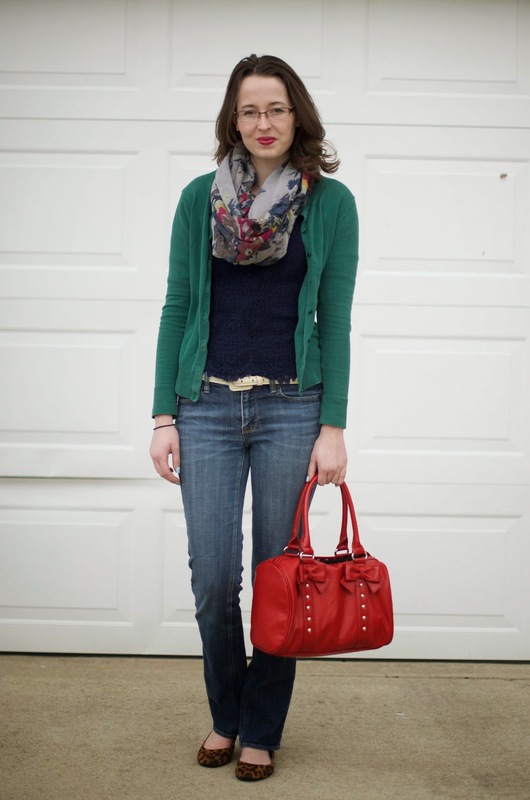 I picked a lipstick that picked up one of the colors found within my scarf, while the red purse just really made the outfit pop! I hope y'all found this helpful and it gave y'all ideas on how to incorporate scarves into your outfits. 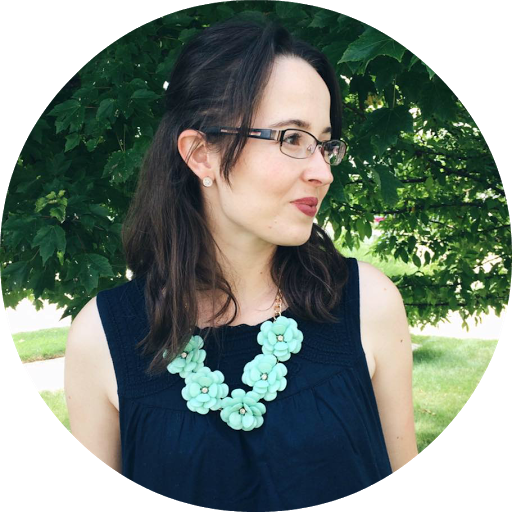 Don't forget to check out Annaliese's blog: Southern Belle in Training for her outfit! And I like that navy lace tee! You see...I think nothing about mixing leopard flats with other patterns. I just treat leopard print as a neutral, and not a print. 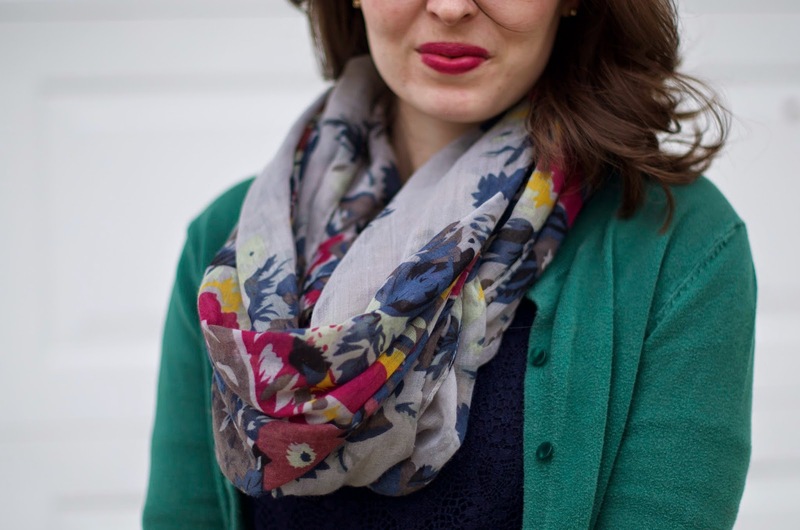 I love how your scarf goes with your lipstick- I think I need to make a Target run to check out that color! It's stunning on you! You should! I think this color would look amazing on you, Lauren. I'm loving that navy lace top, so pretty! Thanks, Abbey! I can't wait to wear it more often during the Spring months. So cute, Ashley! And totally something I would wear. You've both inspired me to yank my scarves out and don them for Spring. Yay! You go rock those scarves girl! 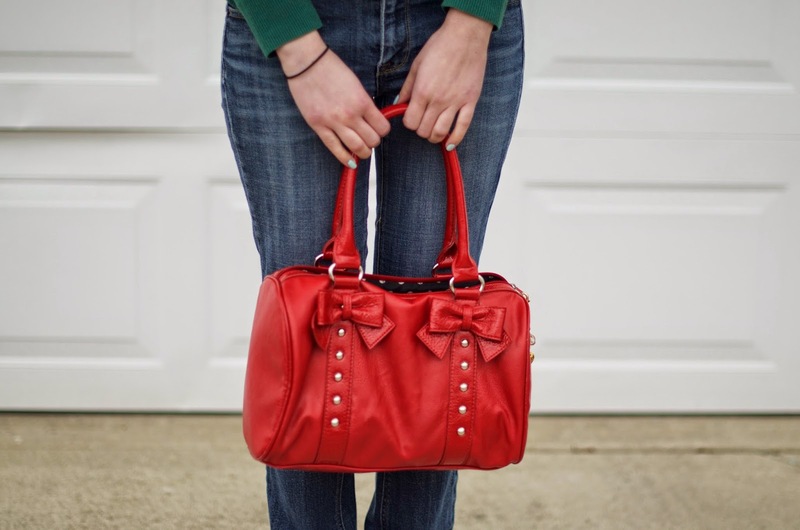 I absolutely love that hand bag :) You are adorable!